Judy's Note: Right after returning from Quilt Market in October, 2005, I got a bee in my bonnet about repainting the family room and changing the function of a couple of the rooms. My house looks a little different today than it does in these photos. 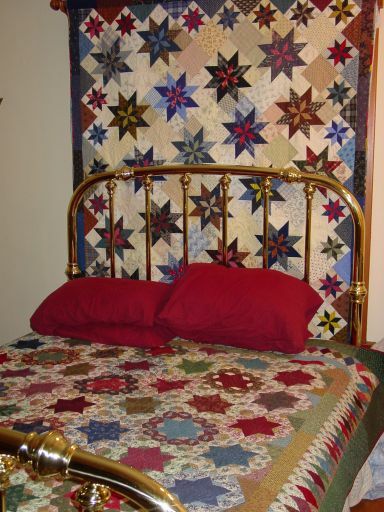 Nonetheless, I think you can get some ideas about ways you can decorate your house with the quilts you make. And if your house is like mine, the decor is constantly evolving! Earlier I posted photos of my sewing room. Now I'll let you into my house. I like to decorate it with quilts. Below are 6 photos of quilts in action in my home. Be patient. It takes a little time for all the photos to load. Before you continue down the page, wipe your feet. There will be no tracking mud on this tour! As you enter the house the dominant feature is the panelled staircase. I drape different quilts over the railings, depending on my mood. This one is the "I Have a Dream" quilt from Cookies 'n' Quilts. When I'm hard at work on the sewing part of a book, I often bring my sewing machine in from the sewing room (above the garage) and sew on this table. This way I'm in the middle of the family action instead of a recluse. It also means that sewing mess is the first thing visitors see! As you turn to your right, you'll see the library. Steve and I are avid readers. The red books on the top shelf are part of a complete antique set of Dickens that I gave Steve for Christmas one year. The library opens into the dining room. 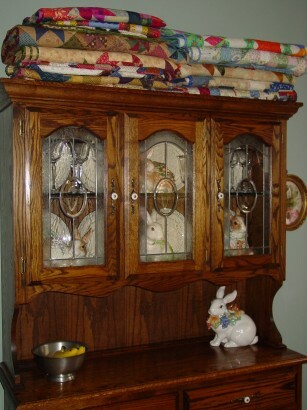 Another way to get a lot of quilts out is to fold them, stack them, and place them on top of large furniture pieces, like this hutch. You'll note several bunny cookie jars peering out from behind the glass. They're from Fitz & Floyd. Please don't ask me to identify all the quilts! 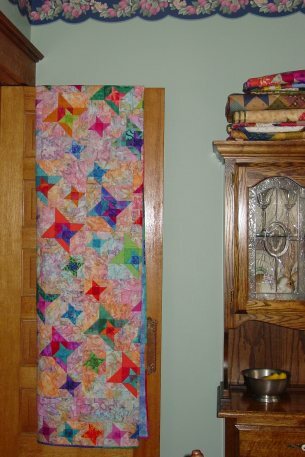 Another way to display a quilt is to drape it over a door that is always left open. This is the door leading to the kitchen. The less said about my kitchen, the better. You may recognize the quilt as the Measure for Measure quilt I demonstrated on "Simply Quilts." The pattern is in Cookies 'n' Quilts. 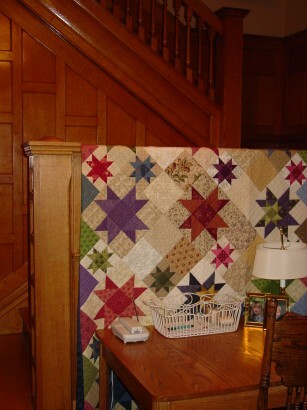 More of the rolled up quilts, this time on the stair landing. Again, there are three quilts. Of the two you can see, the one on the left is the Wilderness Log Cabin. It has a staggered star border, which is all you can see in this view. The one on the right is Horn of Plenty, a variation on 1000 Pyramids. Both quilts are from The Creative Pattern Book. My bed. On the bed is Byzantine Flower Garden, an easier-to-sew version of Grandmother's Flower Garden. Hanging on the wall is Judy's Fancy. Actually it is covering the window for extra insulation in the cold, drafty winter months. A window shade and a blanket hang behind the quilt to protect it from the sunlight. I take down the window quilt in the summer. Patterns for both quilts can be found in The Creative Pattern Book. If you've never seen it, you really should. It's a wonderful book. If you want to see my sewing room, click here. 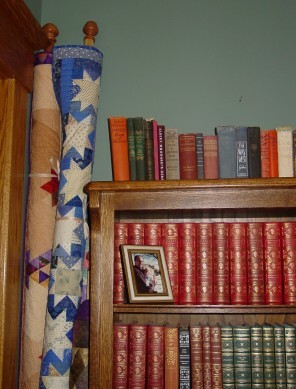 If you want to look at the books that these quilts are from, go to the Navigation Bar on the top left and click on Books. Thanks for coming along on the tour. Have fun visiting the rest of JudyMartin.com.